Two Chicks On Books: Blog Tour- Impostor by Susanne Winnacker and a Giveaway! Blog Tour- Impostor by Susanne Winnacker and a Giveaway! Hey y’all! I have Susanne Winnacker, author of IMPOSTOR on the blog today! I'm really looking forward to reading this one and I think you will too after reading these quotes! 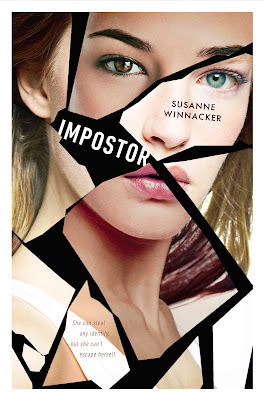 Susanne has a top ten post with her favorite quotes from IMPOSTOR and check below there’s a giveaway make sure to enter to win a copy! Wow, it wasn’t easy to find quotes that weren’t too spoilery, and then it was even harder to narrow down the quotes to only ten. I hope I did a good job! 1. I coaxed the memory of a little girl I’d bumped in the mall. I pictured her delicate features, her narrow shoulders, her slender limbs. I imagined looking through her eyes, inhabiting her body. Immediately, the familiar rippling sensation started in my toes and crept up my calves. - Just love the teasing quality of this! 3. Average human—only Major was able to make it sound like an insult. He looked at me like I was precious, his most prized possession. His trophy Variant. - Well, it’s a good quote to get a taste of Tessa’s relationship with her “boss” Major. He made it sound all clinical and easy, but it wasn’t. 5. And now I was supposed to pose as someone else’s daughter, become a part of a normal family, which was the last thing I knew how to pretend. - This is a very important quote, because it hints at Tessa’s past. 6. Soon, I’d be able to copy her perfectly despite the fact that I didn’t yet know anything about her—not about her worries, her fears, or her dreams. I’d be nothing but a hollow imitation of the girl she used to be. - Good example of Tessa’s worries about the mission. 7. “You always do that, you know,” Alec said. - Okay, what can I say? Playful banter between Alec and Tessa? Enough said. 8. Alec always said his Variation helped him cheat death but the FEA helped him survive. - In this scene we learn more about Alec’s past! 9. A horrible thought crashed into my mind. Had I changed back to my own body by accident? But no, it couldn’t be. Devon didn’t look freaked out enough for that. If he’d seen his sister shape-shift into a stranger, his face would have shown something much greater than puzzlement. - Just love the scene surrounding this quote! 10. What had been a comfortable silence, now felt like the moment when the birds go quiet in the forest and you know something terrible is stalking you. - I always liked this quote. Not sure why, I just do! These are great thanks so much for stopping by Susanne! Need more? Here’s some info about IMPOSTOR! Oh and if you want to enter the giveaway click on the link! I don't think I'd like to imposter anyone. I am a horrible actress and would undoutably end up blowing my cover. What had been a comfortable silence, now felt like the moment when the birds go quiet in the forest and you know something terrible is stalking you.